This weekend has been pretty darn awesome., one that we won't forget for a long time. We set off on Saturday on a rather cloudy day feeling quite gloomy but returned home several hours later full or happiness and warmth. It's been several years since our last visit to the West Midlands Safari Park. Over 3 years in fact as adorable baby Sutton wasn't born on our last visit and now he's 3 years old after celebrating his birthday last week. As a huge animal loving family we were all so excited for our day out. Getting to see all the beautiful animals up close and personal, nothing quite beats that amazing feeling. Most of the animals are free to walk around, among the cars. Only the Lions and Tigers are behind fences but that's probably for the best as it's scary enough being that close to them even though they are incredible to watch. I wouldn't want to get too close to them though - eek. The West Midlands Safari Park opened back in 1973 and is home to around 140 different species of animal. It's four mile long drive through safari is something quite spectacular. We drove around as soon as we arrived, buying 4 boxes of food on entry (£3.50 a box) to feed some of the more gentle animals, like the Zebra, Giraffes and the Deer (Ryan's favorite). It's amazing seeing these beautiful creatures so close up, they literally pop their heads through your car window to say hello or eat dinner more likely but I like to think it was the previous. I had 2 super excited children and 1 rather nervous one who sat hid in the middle away from the windows. You can get as close or as far away as you like, you don't have to open your windows but we loved it. Feeding the animals was magical, just take a look. 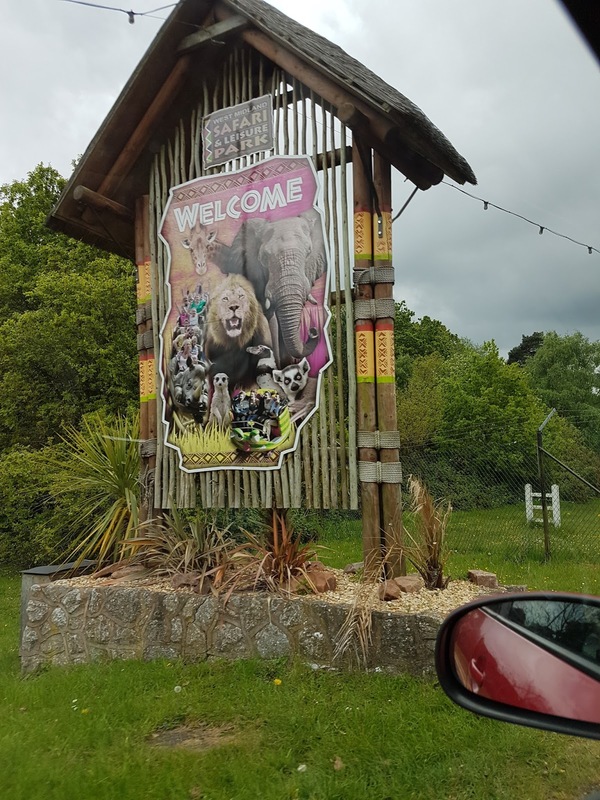 The safari is split into African and Asian areas, full of sign boards with interesting facts and stunning animals running free in groups just going about their day. We stopped by to see baby Sutton who's not so much a baby any more but still an absolute joy to watch. We must have stopped there just watching for a good 10 minutes. Seeing him playing with fallen tree branches and bonding with the adult Elephants around him. He was such a sweetie. We loved seeing the animals so much that we actually drove around the whole safari twice. Once when we arrived at 10.30 am and again a bit later around 3 pm just before we left. The second time was much quieter but both times were just as enjoyable. Ryan wanted to go round again but sadly it was getting late by that time and we finally left around 5 pm. There's so many animals to see, I could show you my photographs all day long but there are just too many so I've picked out just a few to give you a taster of what we saw. The drive through safari is amazing but it's just apart of what's to do at the West Midlands Safari Park. There's also an exciting theme park full of rides for all the family but we didn't go on these as they did cost a little extra, not too much but we were happy just spending our day with the animals this time. There's a Discovery Trail with animal exhibits and shows. A Penguin cove where the coolest Penguins hung out and a Sea Aquarium full of pretty fish. The Twilight Cave is pretty awesome as you get to walk through a cave where bats fly freely around you, Lily was a little scared but the rest of it loved it. It's not for you if you're scared of bats. It's very dark, so be prepared to jump out of your skin like I did when they fly past. 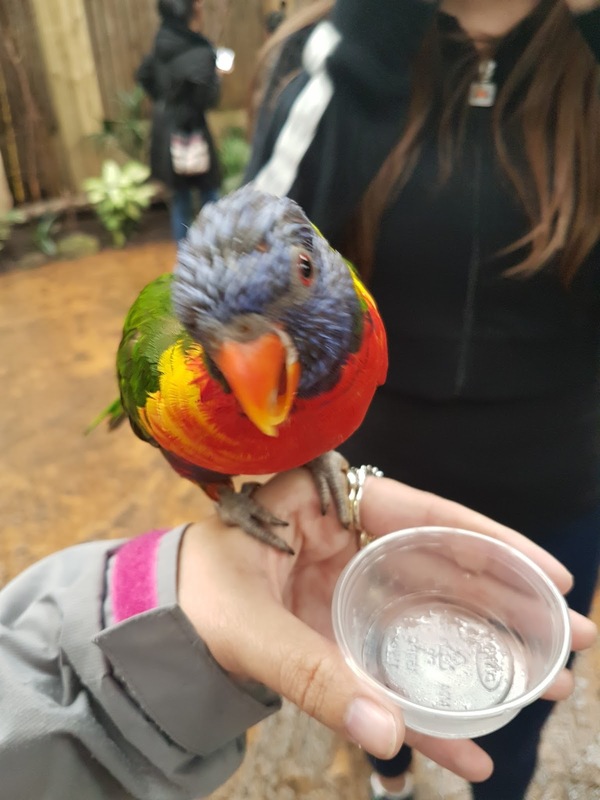 One thing you must see is the beautiful Rainbow Parakeet's in the Lorikeet Landing. It's not open all the time but does open several times a day so do try and time it right. You get to see the Rainbow Parakeets up close as you get to walk through their home. You can purchase little pots of food for them (we bought 4) as feeding them was so much fun. 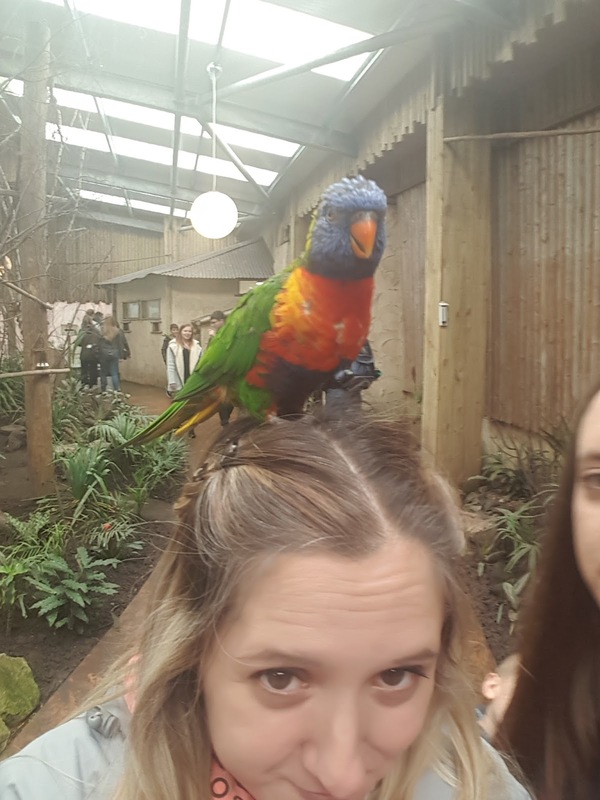 I'd never had a bird on my hand before let alone on my head, my back and my arm. Again if you don't like Birds, it's not for you but for us, this was the highlight of our entire visit. There's so much to see and do at the West Midlands Safari Park. We had an amazing day and can't wait to go back real soon. The animals are incredible, they're all so beautiful and special in their own way. Some may be bigger and scarier than others but we loved them all. There's loads more to do but we simply ran out of time to do it all. 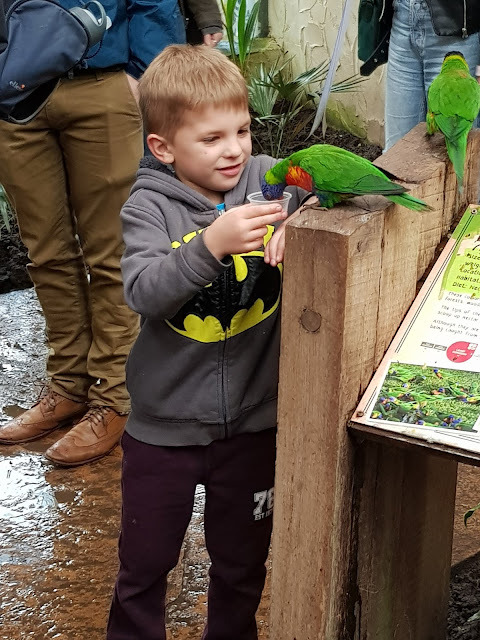 One thing Ryan wanted to do was visit the Land of The Living Dinosaurs which lets you step back in time to come face to face with some of the largest, most unusual and fearsome animals to ever have roamed the Earth. There's over 40 life sized, animatronic Dinosaurs. The roars and movements are very realistic so be prepared to jump once or twice, it was fun and enjoyable to walk around. There's some nice little photo opportunity points along the way too. Admission prices include a free return which is lovely as you get to do it all over again. If you've never been before, you really should, especially if you're animal lovers like us. Disclosure: We received complimentary tickets for the purpose of this review.